In 1871 Chicago had its fire. Mrs O’Leary’s cow kicked over a lantern in the barn. The city was built of timber – not just houses but boardwalks, road blocks, fences – and with the weather tinder dry, four square miles went up in flames as the wind blew them on. The fire jumped the branches of the Chicago river, only stopping when it reached Lake Michigan. For architects it was an enormous opportunity in a land already presenting opportunity as its huddled masses expanded, although now, alas, without Mrs O’Leary’s cow. Burnham’s name became famous as the planner of much of new Chicago. He built, in 1894, one of the first steel framed glass curtain walled buildings, now preserved by the city and operated by the Kimpton group as an hotel. At some 19 floors it is dwarfed by a city that at one stage had the tallest buildings in the world. It was not just upward that the city’s famed architects developed their unique much copied American style however, and one of the architects attracted to Chicago in this boom time, and who grew his own practice on the back of thriving private commissions, was the instigator of the Prairie Style, Frank Lloyd Wright. His predominantly horizontal style was developed in his own house and studio on the prairie edge of the new Chicago, in a suburb called Oak Park. Burnham and Lloyd Wright were just two of the architects of new Chicago whose influence was to change the world’s cities forever. Their influence was early, profound, and diverse – even revolutionary poets and artists such as the Russians Mayakovsky and Tatlin were profoundly moved to want to create an ‘America of the arts’ in revolutionary Russia. In a Europe shortly to be ripped apart by a combination of war and revolution the impact on Chicago arts and design was to be profound. Chicago became a home for refugees from Russia and Germany, including architects and artists from the equally influential Bauhaus such as Gropius, ironically whose buildings were recently demolished by the same City authorities that saved the Burnham building – perhaps because he was an immigrant? Frank Lloyd Wright was invited to join the architectural practice of Sullivan and quickly developed a private body of work for neighbours in the Oak Park suburb that he lived in, despite his employment contract forbidding private work. Eventually Sullivan discovered his employee’s deceit when he found himself supervising a private building next to one being done by Lloyd Wright. His private practices perforce became FLW’s main employment and his house in Oak Park was extended eventually accommodating his own design studio. 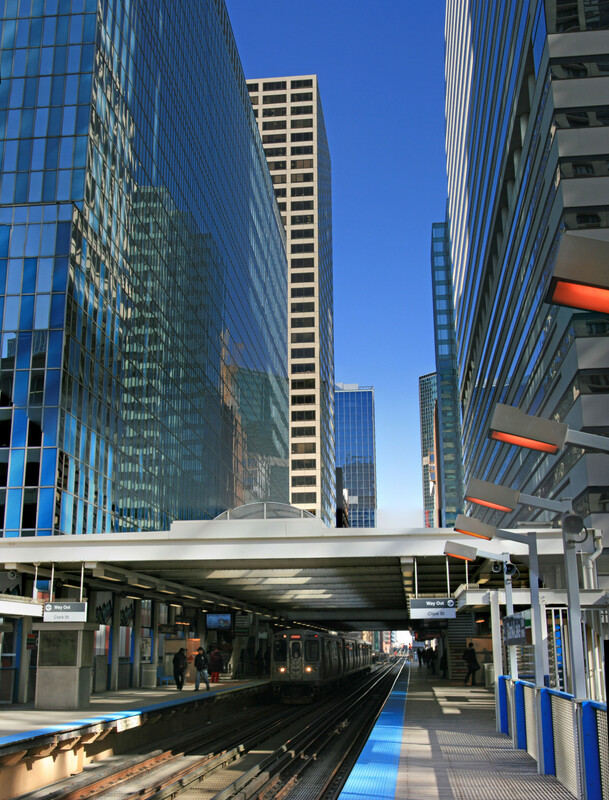 Oak Park still has over 25 of his buildings in the near neighbourhood of his studio, which is an easy train ride on the Elevated Railway Green Line from the Chicago loop. For any design enthusiast this must be a trip to take when visiting the city. The Frank Lloyd House is open to the public with tours conducted by volunteers, enthusiastic Frank Lloyd Wright fans. His interiors are executed in simple materials with oak the predominant timber, floors being of a cement mix that contained two types of wood chip enabling it to take a polish like linoleum. With coffered ceilings and painted panels, including in the family room a mural of Aladdin and the Genie of the lamp, the house has all of the bones of his architecture but stays human in scale and friendly in feel. The influence of the Arts and Crafts movement is strong, chairs having a distinct likeness to the work of Scottish designer Macintosh, for example. Design tricks include placing a grand piano so that the bulk of the strings are suspended above an adjacent staircase to free up space in the room the keyboard is housed in. The influence of Japan and Japanese prints, so evident in the Arts and Craft Movement in Europe in the 19th Century is evident here too. Not just through Wright’s own collection of Japanese prints but also through the use of strong horizontals (a reflection of the prairie landscape that this area looked onto in the 1890’s) and angular pitches of the roof and balcony lines in his domestic commissions that can be seen on a short stroll from the studio. The evolution of the Prairie Style can be easily followed here, although the Nathan Moore house sparked an argument between myself and my companion who maintained that Wright would never succumb to using ‘Tudorbethan’. Despite being rebuilt in 1924 after its upper floors were destroyed by fire, the words of the commissioner of this house echo through time. He pleaded with Wright to build him a house that avoided the embarrassment of his being pointed at by neighbours whilst on his commute, as previous commissioners of Wright homes had been. The Nathan Moore house – emergence of Tudorbethan? The community obviously took to his architecture however, as he was invited to build the Unity Temple, which he built using a revolutionary concrete pour technique. As with much early technological innovation the material was inadequately understood and the lack of expansion joints is now rapidly destroying this important building, and the church needs to raise nine million dollars for a full restoration. The evidence of the scaffolding outside on my visit indicated that the process has started. 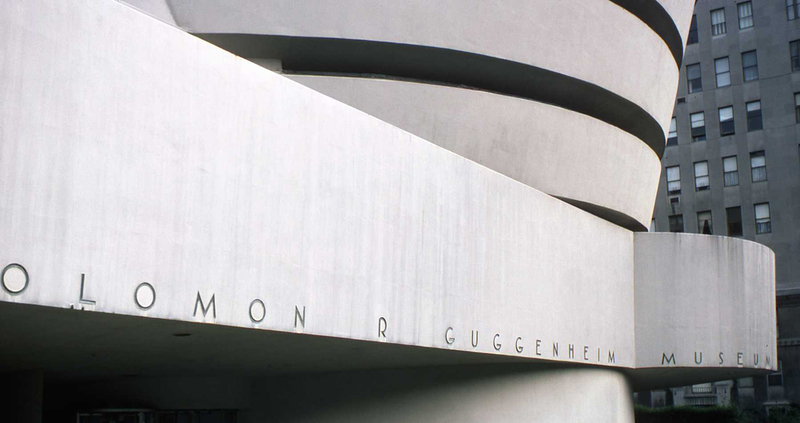 Arguments still continue about Wright’s use of colour, and a long debate raged around his 1959 Guggenheim Gallery in New York, now painted white although the belief was that it was originally a buff colour (photo dates from 1976). Like his own home the Guggenheim was designed from the inside out. The visitor being invited to take the lift to the top of the building then to follow the sweeping curved floors down through the art as they spiral to deposit them at the ground floor. 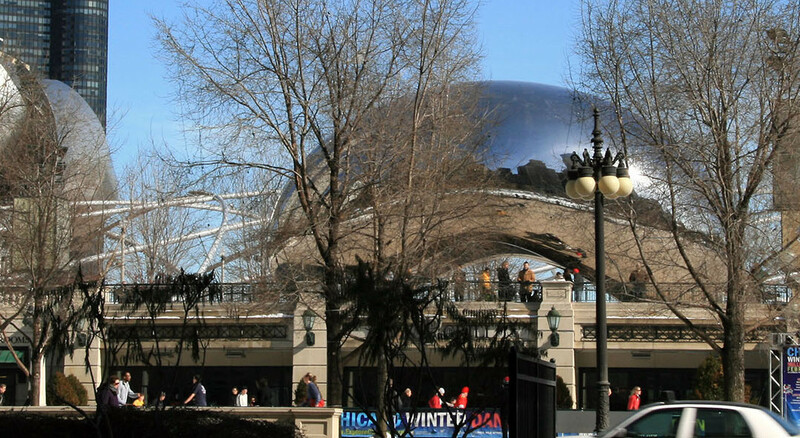 The superb balance between the aesthetics and functionality of his buildings is typical of the architecture of Chicago. As Burnham embraced technology in the advances shown by his Reliance Building (now the Burnham hotel) so Wright changed the perception of how space worked internally in the American home, leaving a legacy of graceful buildings as well as a stylistic influence still powerful today on both interior designers and architects alike.